We plan to conquer Santiago Peak for the first time! The planned route is to reach the summit via Silverado Canyon Road and pick up the Maple Springs Truck Trail from there. This is a Newbie ride because we are definitely dirt newbies! So we won't be tearing up the trail, jumping, popping wheelies....not yet. LOL! We'd be lucky to keep it in 2nd gear. What is this: Dual sport ride to Santiago Peak. Part on road, part Fire Road. Emphasis on "road" just not paved. Gravel, dirt, rocks. Weather Concerns: In case it rains a lot tomorrow and the trail to Santiago Peak becomes a muddy mess, we might change the ride to South Main Divide/Wildomar Truck Trail off of Ortega Highway. This is an almost all paved, goat trail that leads to Murrieta. We plan to ride it as far as we can road conditions permitting. So if you plan to join, just keep in mind that we may change it last minute. After the ride, we plan to go to lunch somewhere in the OC. But just in case, bring a snack. At your speed or ours? LOL! If we have time we might keep riding towards the North Main Divide. I'm beginning to think you just don't want to ride with us! I wish I could do this, just a bad weekend for me. Have fun and watch for the trucks/Jeeps on the corners. Don't take a wrong turn down a hiking trail, it really pisses the bi-peds off. I'll be waiting for you guys at the Maple Springs gate. Chris we had some minor bike issues as we were leaving so running about 15 min late. But we will be there. thank you for heads up. waiting at gate, looks like a nice day for a ride! due to mechanical difficulties i had a wonderful ride by myself. Sorry about that Chris. Needed to make sure my friend made it home safe. We will try again very soon. These are the extent of my pictures. Waiting at Cooks Corner. The most interesting part of the day. 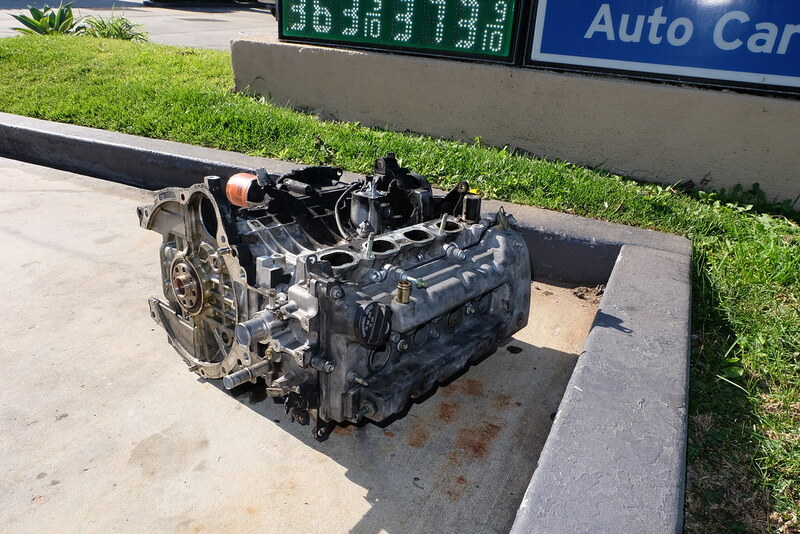 While we were trying to keep the rear tire in OOTV's Tiger inflated, which we had to do about 3x until he got home, we found this engine in the parking lot of one Chevron. Someone just dumped this here. LOL! 1.) Once up to the peak - picked up a nail on the trail LOLOL. Luckily a random forum guy showed up for the ride and he brought a plug kit so we plugged the tire so that I could ride the rest of the day. 2.) I got another flat in the side section of the carpool lane having the 5 North on the way to motorhelmets Bike Night. I plugged it myself at a gas station and used their pump to fill it up and rode the rest of the way to the bike night and home. 3.) Coming back from the women's motorcycle show in La I got another flat where a screw went all the way through the tire. This time I felt Ultra prepared because not only did I have a plug but I had the electric slime pump that I could attach to my bike battery. Unfortunately that pump killed my battery even with the bike running so I had to Uber home to get my truck to come back and pick up the bike anyways. Lesson learned all of my tubeless Rim motorcycles I carry a plug kit and an electric pump. I may Instead try carrying those little CO2 cartridges instead. I don’t yet have a way to fix a tube tire. I’m relying on Ride On to avoid a flat. But I really need to learn how to break the bead and replace a tube on my DS. I’ve done it half a dozen times on my road bicycle but never on a Dual Sport. Having said that I’ve plugged my tubeless tires many times. Glad you guys made it home safely, the dirt ride would have been anything but enjoyable on a flat. Video shot at the top. Oh wait...the tiger has a tube in the rim?? The pretender is going to hate me..."this is why you have multiple dirt bikes LOLOL"
The stock Tiger XR wheels are a 19” front and 17” rear, both cast wheels with tubeless tires. My friend wants to get it more dirt capable so he is having me update and replace bits on it. This was going to be a test of the new 21” front and 17” rear spoked wheels. Technically it’s his bike but mine while he’s on location. 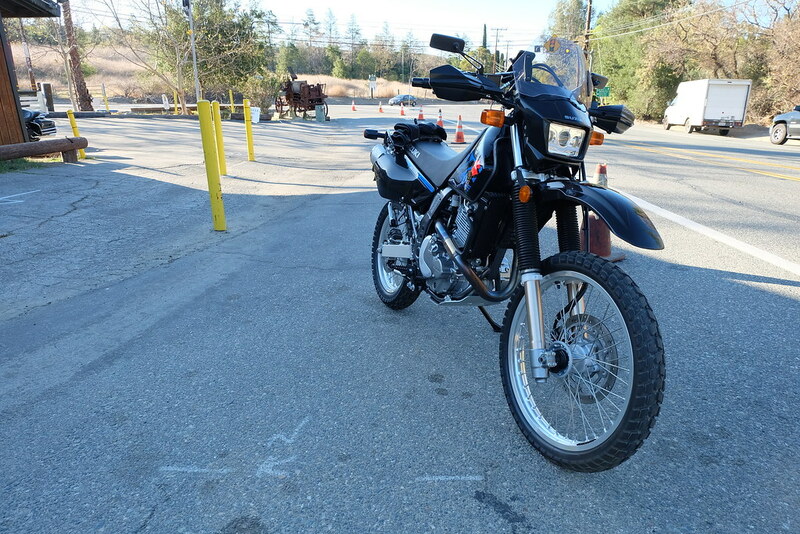 Since Rogue wants to explore more non paved roads, I figured I coul do double duty, get my friends bike setup and have fun with Rougue. When I got home I immediately removed the wheel and changed the inner tube. The hole was exactly opposite of the valve stem and was on the inside (spoke side) of the tube. It was a very small hole but enough to leak all the air out over night and enough to leak out over a few minutes to make stopping a few times a must. New tube is in and looks to be holding air. One side affect of the 21” front tire, the traction control keeps kicking. Theory says that the front, which is possibly where the speed reading is coming from, rotates “slower” than the rear and makes it seem to the computer that the rear is going faster than the front, so it keeps turning on traction control. It’s easily defeatable but does require changing the setting after every time I turn the ignition off. One post my friend found, the rider said he just rode it hard and fast, even redlining the bike and it appeared to recalibrate. Not sure if that’s the best method of doing it but I imagine there’s a way to recalibrate it, possibly an ECU flash or reset procedure. Page created in 0.363 seconds with 59 queries.